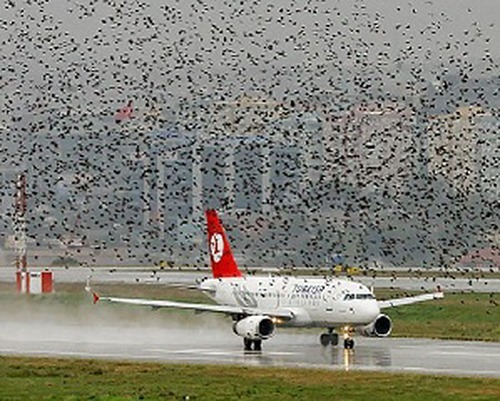 Bird strikes are a significant threat to flight safety, and have caused a number of accidents with human casualties. The most deadly bird strikes were caused by flocks of starlings, according to an FAA report in June 2008 on wildlife strikes, including a 1960 incident that killed 62 people in Massachusetts and a 1996 military crash that killed 34 people in the Netherlands. The majority of bird strikes cause damage to the aircraft and are usually fatal to the birds. Most accidents occur when the bird hits the windscreen or flies into the engines. These cause annual damages that have been estimated at $400 million within the United States of America alone and up to $1.2 billion to commercial aircraft worldwide. Birds are attracted to fresh water ponds and man-made storage ponds that have been constructed near runways for the airports many needs. Some of them have been netted in the past to prevent birds from gaining access to the water. However, netting does not camouflage the water and therefore still attracts waterfowl. Because netting does not block sunlight, algae and weeds strive, making these areas a desirable place for the birds to roost and feed. Furthermore, netting does not last as long and is susceptible to snow and ice in cold climate. Aiports can greatly benefit from adding an Armor Ball® floating cover that will camouflage the water surface and significantly reduce bird activity in and around the previously open water areas. Floating bird balls covers are approved by the FAA and easy to install.